Meat thermometers have become very important weapon for checking doneness level of meat to make sure that it’s not over or under cooked. Under-cooked meat can have disease causing bacteria like salmonella which hazardous to our health when consumed. So, in order to make sure that our food has been thoroughly cooked, we should have to use meat thermometer. No doubt, meat thermometers have become an essential tool for our kitchens. Although, you can use fork to check the meat whether it’s cooked or not but meat thermometer makes your job very easy. So, whether you are experienced or in experienced cook, meat thermometers are your best friends to check meats cooking temperature. There are other meat thermometers with preset temperatures and alarm functionality that will notify you when meat temperature reaches to your desired temperature level. You should have to take notice that the whether the preset temperatures of thermometer are approved by USDA (United States Department of Agriculture) or not. Meat thermometers with the passage of time are becoming very user friendly. As earlier designed meat thermometers were dial only but now meat thermometers comes with LCD and digital functionality as well. They have become very easy to use now a day. Some notable features you should have to see in your meat thermometer is alarm and LCD features at minimum. I have said at minimum, because there are meat thermometers with many advance features including wireless, Bluetooth, radio frequency enabled kind of thermometers available in the market. One of these high functionalities enabled thermometers with very reasonable price are thermoprotp20, thermopro tp22, thermopro tp08, thermopro tp07 and list goes on. You can see some of the best top 10 best thermopro thermometers also for a quick view. Thermopro tp16 comes with the basic 2 features we have discussed above including large LCD and Alarm functionality. This is leave in meat thermometer which means you have to leave its probe into the meat you want to monitor temperature of. Beside this, this is a low priced meat thermometer as compared to tp20 or tp22 etc. But some time product design appeals you most and that product also fulfills your basic requirements as well. 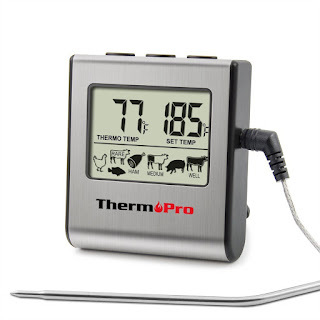 Thermopro tp16 is one of the best designed and beautiful looking meat thermometers you should have to consider for your kitchen. Although, this thermometer is affordable and has basic functionalities a meat thermometer should have, this is also one of the best-selling amazon’s meat thermometer which is a proof of its functionality and customers likability. TP-16 thermometer comes with Preset temperatures approved by USDA integrated with programmable alerts. This meat thermometer is best suited for any kind of cooking i.e fast cooking or slow cooking whether its stovetop, smoker or oven. Large LCD size for easy reading. TP16 digital thermometer can read a vast scale of temperature ranging from 32°F all the way to 482°F or 0°C up to 250°C. 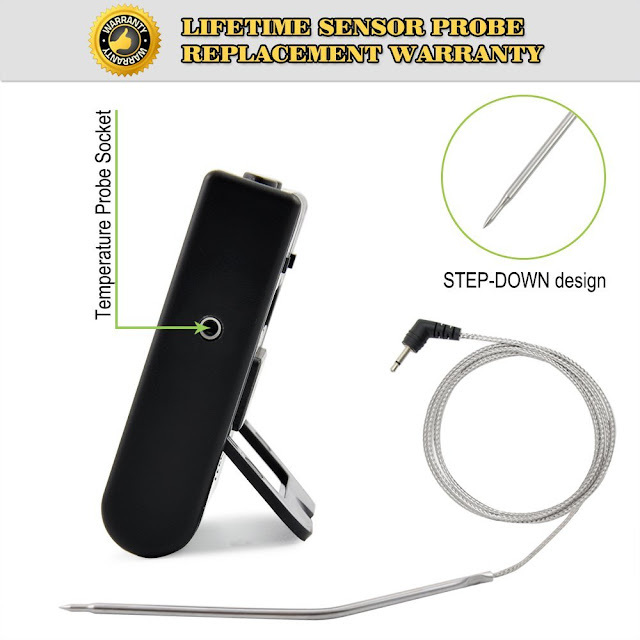 Metal probe with step-down tip gets the temperature very quickly and precisely. Connection cable that connects metal probe to the digital display is made up of stainless steel results in enhanced durability. You can easily manage your thermometer to place it on counter-top or on magnetic friendly surfaces because of its flip-out stand and magnetic back. You have options to display temperature in Fahrenheit or Celsius. Safety is always guaranteed with this digital meat thermometer because of its CE-certified, RoHS, and FDA-approved probe. You need only one AAA battery to operate this large LCD digital meat thermometer. Approved metal probe by USDA, RoHS and FDA. 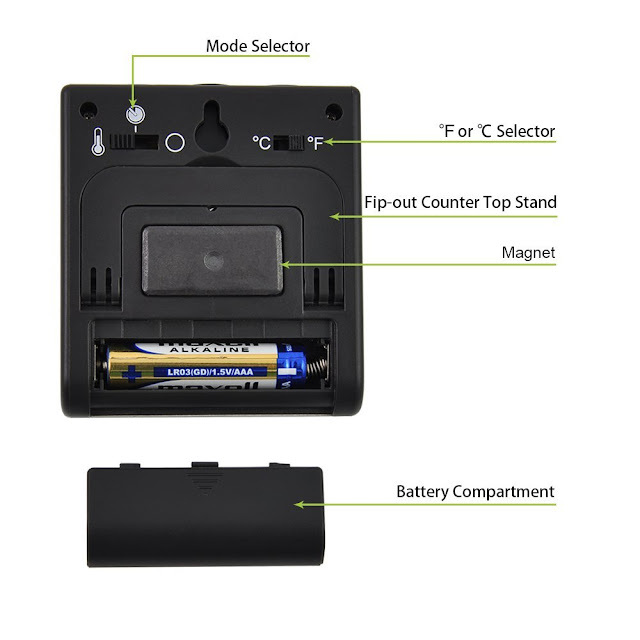 Easy and quick temperature readings because of its large LCD. This is a best digital meat thermometer for budget shoppers as it’s very affordable and budget friendly thermometer. Life-time Sensor Probe Warranty with very active customer support team by the manufacturer i-Tronics. 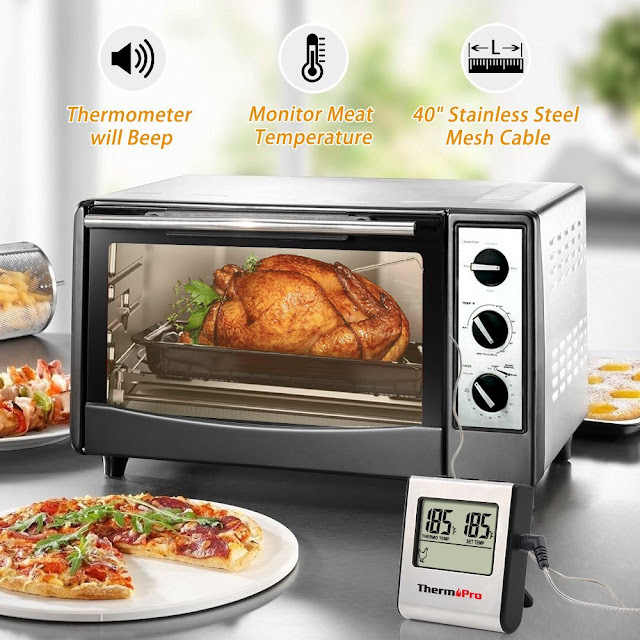 You have freedom to use this digital meat thermometer with variety of cooking processes including boiling soap, grilling a lamb, baking casseroles, grilling a beef or pork, roasting turkey or chicken etc. Tp16 digital meat thermometer comes with preset temperatures approved by USDA which guarantees food safety. You have freedom of doing several other tasks while cooking because of its alarm and count-down features. TP-16 digital meat thermometer does not show temperature & time at the same time. Programming temperature is not user friendly. It’s bit difficult to set. Magnet may not hold long on magnet surface because of its weak magnet. You can use this thermometer for cooking several foods at the same time because of its one metal probe. If you are seeking thermometer with more than one probe then thermoprotp20 and thermopro tp22 is another option for you to go with. Thermopro TP-16 digital meat thermometer with large LCD is very budget friendly meat thermometer which does its job very well. Features are very handy. 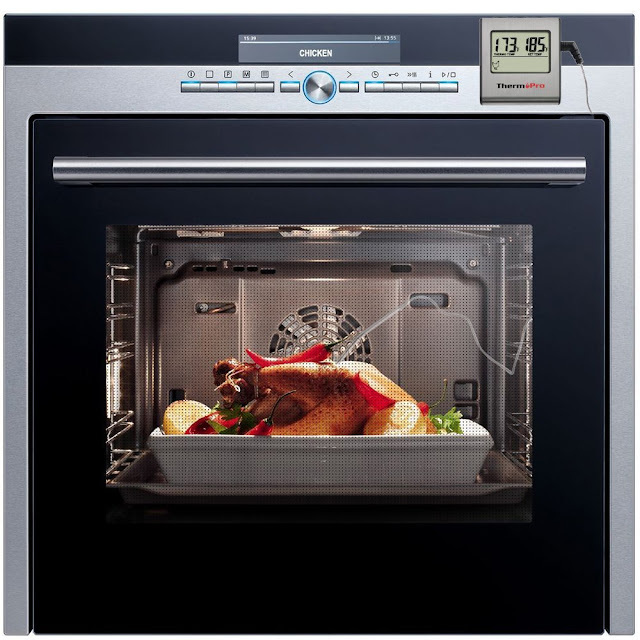 Large LCD with alarm function is some of the notable features of this digital meat thermometer. Although, it has large LCD to display temperature readings, it cannot show temperature and timer at the same time. So, at one time you only have to choose between timer and temperature. Metal probe also works well. Although, at this reasonable price single metal probe is enough to go with but it could be better if there were two metal probes. Limitation of any product is the main thing where alternatives play best roles to serve better. 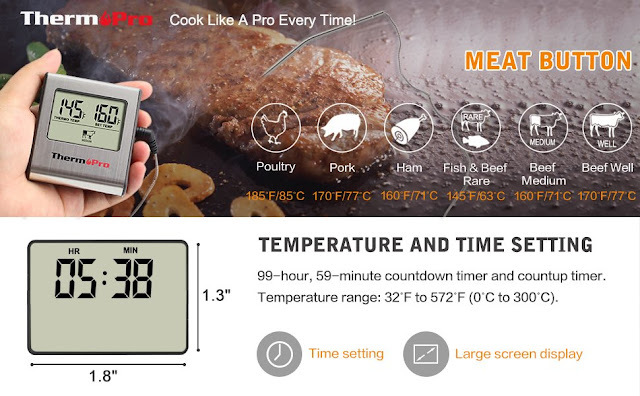 As we already have seen that we have limited features in thermopro tp16 as we don’t have option to monitor our cooking remotely with this tp16 digital meat thermometer. If you have some higher budget and seeking for remote featured-enabled thermometer with some other advancements then there are several options for you to go with. 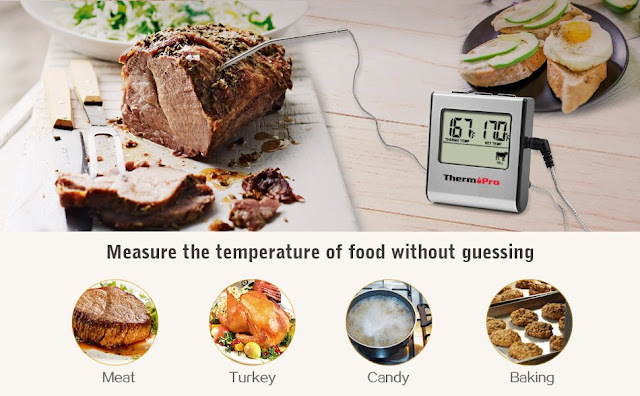 Thermopro tp08 is medium priced digital meat food thermometer you can try. Thermopro tp20 and tp22 are some of the best-selling but bit of high priced digital remote wireless meat food cooking thermopro thermometers worth tying for your cooking. You can monitor your cooking from 300 feet away with these above mentioned alternative meat thermometers. So, you can enhanced your productivity by spending more time to do other works during cooking, you can watch TV or mingle with your family and friends while your thermometer will do your work and will inform you with alarm about your cooking. Thermopro TP16digital meat thermometer with large LCD is totally recommended by me for kitchen people who are seeking for low priced kitchen thermometer that provides an easy to read precise temperature readings. Admitted, that it lacks some of the features which other new thermometers have, but as compared to price this is a best tool for your kitchen to add. Thermopro TP16Digital Meat thermometer does its job for what it has been designed. TP16 provides you with the temperature reading beside of having you to poke the meat with a fork from time to time. It gives you result with convenience that you want to achieve, Not to mention, Food Safety.